I look forward every year to doing this story, a short list of new and classic children's books that would make good gifts for Hanukkah, Kwanzaa or Christmas. That's partly because I get to visit the most enthusiastic booksellers in the world, like Valerie Lewis, owner of Hicklebee's Books in the Willow Glen neighborhood of San Jose. Lewis is very fond of The Frog Who Lost His Underpants. "'Walking through the jungle left foot, right foot. Kicking up the lakka leaves, making up a song. Walking through the jungle one step, two step, goes the teddy bear, when who should come along? Orange-spotted jungle frog!' And that's how it starts," Lewis says. "It's a rhythmic walk through the jungle." 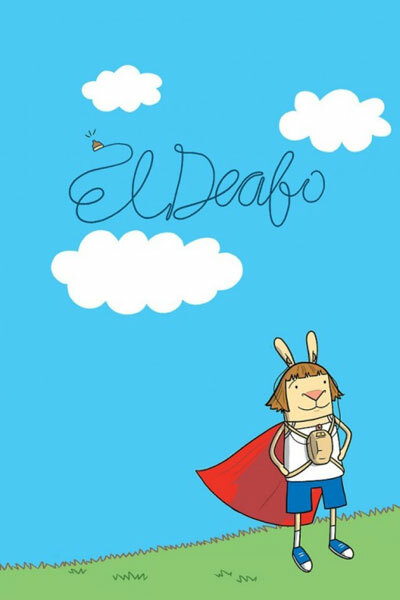 She is also a fan of El Deafo, a memoir by Cece Bell. It's a graphic novel featuring a rabbit -- "They're all rabbits," Lewis notes -- who has to wear a bulky hearing aid around her neck. "This is her story, about what it's like to be that different kid," Lewis says. 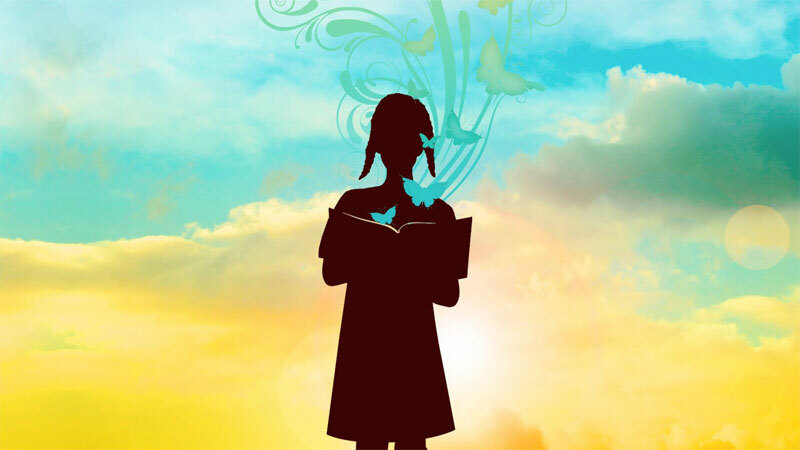 "And throughout the story any child who feels different -- whether it's because they have a physical problem or they just feel they don't fit in -- they'll eat this book up." "But the women said no. ‘We won't have a girl named Jack,' my mother said. And my father's sisters whispered, ‘A boy named Jack was bad enough.' But only so my mother could hear." "You don't have to be a black girl born in the south and raised in New York to be able to identify with this," says Lewis. "There's so much about family. Things that'll make you laugh. Things that'll make you cry." Brown Girl Dreaming is a rarity, NBA or not. It's hard to find kids' books by or about African-Americans. But not at Marcus Books in Oakland. "Not here. We specialize in that, so definitely not here." Janese Irby works at Marcus Books in North Oakland with its deep selection about black people everywhere. Irby says she fell in love with books because her mother read to her as a child. Now her list is shaped by her own three year old daughter, who adores ballet and, consequently, Debbie Allen's classic Dancing in the Wings. 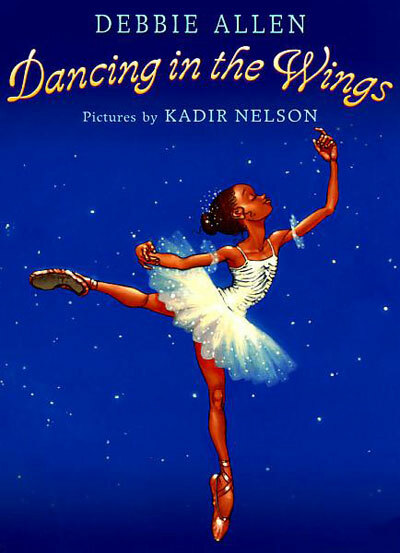 It features pictures by Kadir Nelson, an award-winning kids' book illustrator from Los Angeles. The cover shows a little black girl in a pink tutu. 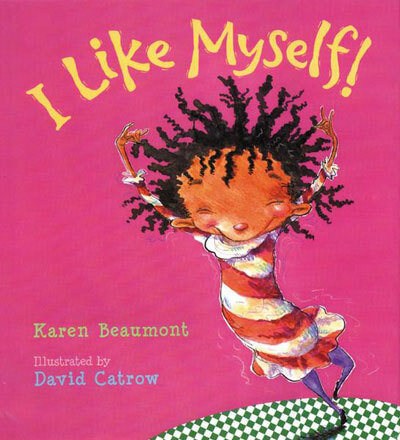 Irby's daughter is also a fan of I Like Myself by Karen Beaumont. "I like me wild, I like me tame. I like me fast, I like me slow. I like me everywhere I go." Irby says, "This one is one of those books where you can't tell if it's a girl or a boy, or really what race it is, and my daughter had me read this one for about 6 months straight." Race isn't an issue in children's books featuring non-human characters, and Simona Ciraolo nicely finesses the issue in Hug Me, a story about a cactus named Felipe. It's a favorite of Ashley Despain, the children's book buyer at Green Apple Books in San Francisco. Despain says, "This one really kind of tugged at my heartstrings, because I was born in Arizona, and this is about a little cactus." Despain has no kids of his own, but for years he's tested his favorite books on his 24 nieces and nephews. One thing he has learned: skip the moral, as in Shh! 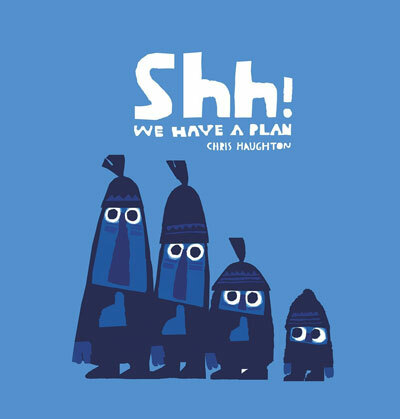 We Have A Plan, a beautiful picture book by Chris Haughton about some clumsy bird hunters. "They're not telling you, ‘Oh, you must be nice,' or ‘Oh, you can't harm birds,'" Despain says. "It tells these stories in a very subtle way that kids understand. It's just really nice stories and you can take away from it what you will." This year, you can also enter the world -- literally -- of a popular kids book, one chronicling the adventures of a professional bird-chasing dog. Twenty years ago, Oakland's J. Otto Seibold and Vivien Walsh published Mr. Lunch Takes a Plane Ride, inspired by their own Jack Russell Terrier, Dexter Lunch, and his plane trip from New York to San Francisco. 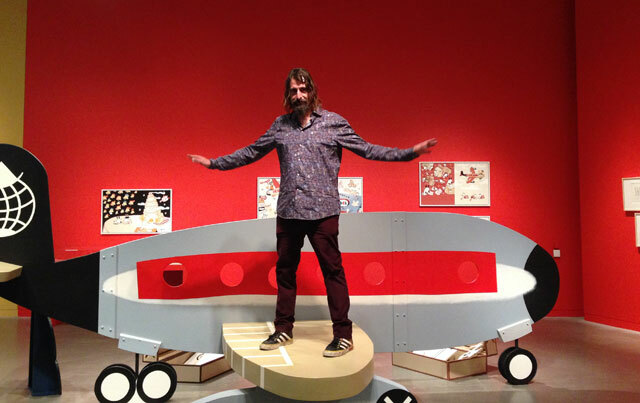 And now the Contemporary Jewish Museum has filled a gallery with Seibold's old sketches and layouts, plus kid-size versions of stuff from three Dexter Lunch books. There's also a huge play area for kids, equipped with suitcases, a jet, and a boat; visitors enter through a security gate where they can get their passport stamped. "[Mr. Lunch Takes a Plane Ride] was definitely based on a true dog travel experience," Siebold said recently as he walked me around the show. "I used to call him ‘Lawman' because when we'd go to the park, he would break up dogfights. And I was just like, ‘that is an honorable guy right there.'" Seibold is also famous for Olive the Other Reindeer, which was made into a movie with the voice of Drew Barrymore. All of his books are filled with puns and cheerful, loony characters, which rather describes the tall, bearded Seibold himself. He plans to make regular visits to the exhibit during its run (through March 8, 2015) -- all the better to encourage a bit of creative chaos. "You can't allow a bunch of children to come into a big fake jet and not have them jump all over it," Seibold says. "I've raised three kids and things you couldn't imagine happening have happened. So it's almost a shoo-in." The great thing about giving books as presents, I think, is that they have such a long life. The wheels never fall off, the batteries never die, and the book we most loved as a child may become a favorite for the next generation. "You very often find people picking up [a book]," says Hicklebee's Valerie Lewis, "and holding it to their chest when they're talking about it, because it's dear to them. It's sort of a natural thing you can do." I'm holding a copy of Ruth Stiles' My Father's Dragon close to my chest right now. "One of my favorites for the preschool set. Wherever young Samuel Drew goes, his dog-on-wheels goes too. There is much to see on every page as Samuel travels through town to the zoo and back -- with possums and surprises in tow. 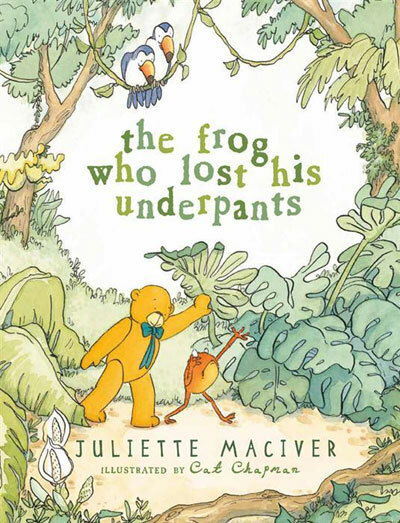 "The idea of a frog with underpants is funny enough, but the illustrations of this frog in despair with his dear friend bear and the culprits who stole the beloved briefs will have youngsters laughing out loud." "Starting a new school can be scary, but when you come with a giant hearing aid strapped to your chest it can be downright embarrassing. This warm, often funny graphic novel about growing up deaf will appeal to any youngster who feels different from the others in school." "In mesmerizing verse, Woodson tells the story of growing up as an African American in the '60s and '70s in South Carolina and New York City. Woodson has the rare ability to make the reader feel part of her conversation. Touching and powerful, each page -- each poem -- can be read as a story in itself." "A swashbuckling adventure for readers of fantasy that takes place in 18th-century England. Kit Bristol is the unwitting servant of notorious Whistling Jack who arrives one night bleeding from a mortal wound. Ben dons the man's riding cloak to seek help, and changes the direction of his life. Magic, a feisty fairy princess, a magical map & true love." "Brilliantly nuanced illustration and design complement the story to a satisfying conclusion." "I have a soft spot for cacti, and this sweet gem of a story definitely tugged at my heart-strings." 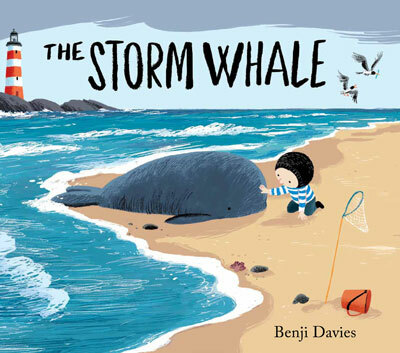 "The story of a boy trying to rescue a beached whale, but if you look a little deeper you will uncover a very powerful relationship between a boy and his father." "My favorite classic picture book. Conflict resolution in the most creative way."